Ever wondered why the “spicy” sambal is getting sweeter these days? I guess somewhere in the universe, some planets or stars must have crossed paths and the nasi lemak sellers down in Malaysia have decided to put more sugar (instead of chilly) into the “must have” concoction. 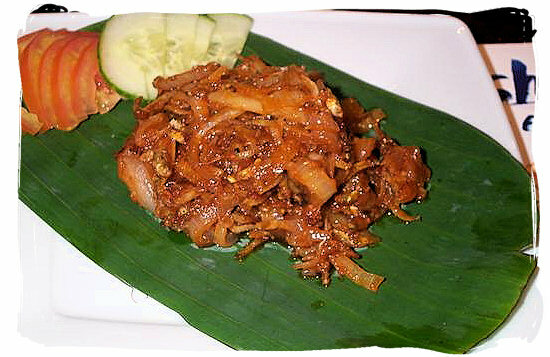 All this while, all we know about the sambal is that it is red, have plenty of chilly and it is hot! Now we are hearing “sweet sambal” where it is still looks reddish, have plenty of chilly but instead of being hot and spicy, it is sweet and in real sense, tasteless. Faced with the question “you want the sweet sambal or the spicy sambal?” our choice was too obvious. But sadly, the “spicy sambal” that the makcik had was not that spicy – a big letdown early in the morning. But at least the makcik has a choice. The other place I often go to does not even have a choice. Their mainstay sambal is the sweet sambal which probably explains why their nasi lemak is one of the least popular dishes in their menu. Their curry is spicier than their sambal and with a load of curry; their santan rich nasi lemak gets some “pride” back. To make good on the “losses” on not getting the spicy sambal these days, what we do is that to cook up a really spicy sambal at least once a week – really spicy in the sense that we can feel “fire” in the mouth. We have been having way too much sugar in our spicy dishes on the outside. Posted on 24 March 2009 2 August 2012 by B.JoePosted in FoodTagged Food, Malaysia, Nasi lemak, Orang Asli, Sambal, Spicy Sambal, Sweet Sambal. you know u are always an Indian at heart wen u go around looking for spicy stuff! That must be around Bukit Puchong, right? Why not try Indian stall somewhere near Batu 14? I have same opinion with you but I don’t mind eating sambal which is ‘slightly’ sweet as long as it is tasty. My wife will get really mad if she gets nasi lemak with sweet sambal. She won’t touch. Wow, that’s right – it looks like not many Orang Asli nasi lemak sellers left. I occasionally pass by Batu 14 – need to check out the Indian stall. My wife still tolerates “sweet sambal” but sometimes too much of it get on her nerve too.